KAIROS Blanket Exercise in the news! 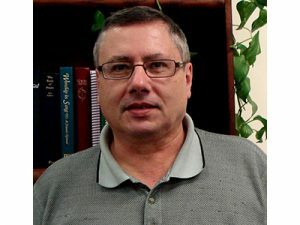 John passed away suddenly of complications related to cancer on June 5, 2017, surrounded by his loving family. He was 68. He is survived by his wife, Marianne, and two children, Timothy and Norah. John will be deeply missed by his colleagues at KAIROS, civil society allies, and partners in movements around the world who will carry his commitments forward. John served the Canadian churches in ecumenical social justice for 44 years. He was a researcher, writer, analyst, but most importantly a persistent and faithful advocate for marginalized peoples everywhere. It was to the needs and concerns of women, Indigenous peoples, poor communities, and the cries of the earth that he held himself to account. Read more. Leer en espagnol. 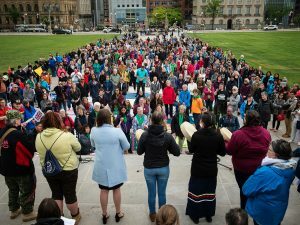 Despite the threat of rain, about 800 people converged on Parliament Hill on June 2 for the largest KAIROS Blanket Exercise ever. 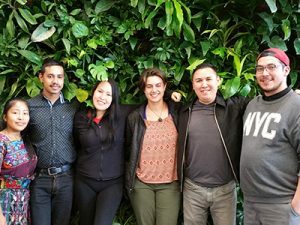 They came to mark the second anniversary of the Truth and Reconciliation Commission’s 94 Calls to Action and renew their commitment to reconciliation. Read more. There were just a few actual seeds, but so many more metaphorical seeds of truth, friendship, and solidarity. It was the seeds of truth that first brought us together. The KAIROS Blanket Exercise (KBE) is less than an hour of truth-telling; a few small but crucial kernels of the history of Canada. A quick sketch on the chalkboard and a compressed overview of the history of Guatemala confirmed for the whole group what our Guatemalan partners had told us: the history of colonization, a history of attempted genocide, has so many commonalities between our countries. Read more. 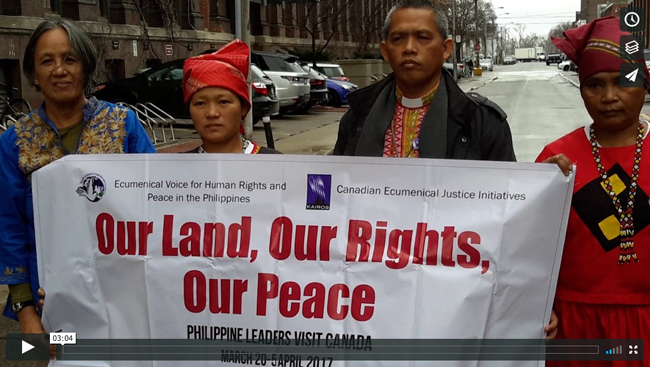 TVO’s The Agenda interviewed Bishop Ablon and EcuVoice’s Anie Baptista, delegates from the Philippines, during the Toronto leg of a cross-country tour organized by KAIROS to highlight the impacts of Canadian mining in their country. Joined by Emily Dwyer of the Canadian Network on Corporate Accountability, they discussed the impacts and what Canada can do to make Canadian overseas mining operations accountable. The segment aired on May 31. View. On March 23, Philippine President Rodrigo Duterte placed the island of Mindanao under military rule following an armed encounter between the Maute militants and the Philippine military in Marawi City, Lanao del Sur. 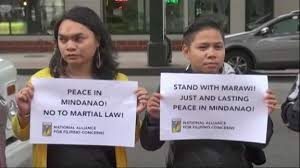 Philippine church leaders and human rights organizations are expressing grave concern that the imposition of martial law will further destabilize the already fragile peace and result in more human rights abuses in the region. KAIROS issued a statement of solidarity and prayer for peace in Mindanao. Read the statement. 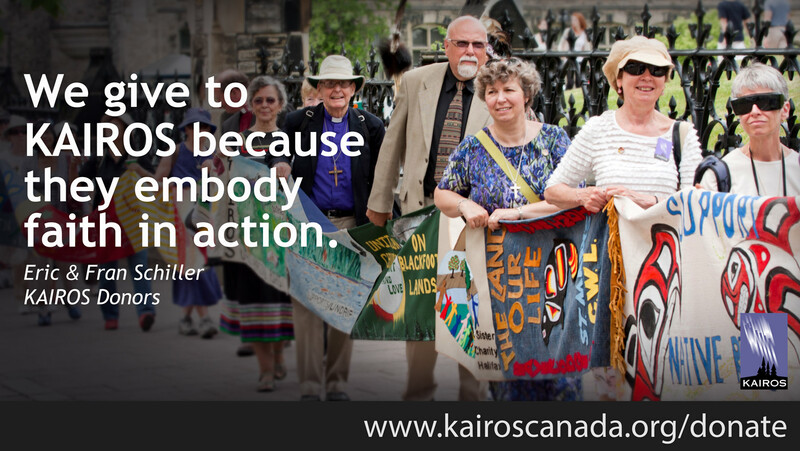 KAIROS was active during the May Month of Action for Mining Justice, a campaign of the Canadian Network on Corporate Accountability, of which KAIROS is a member. KAIROS took part in several aspects of the campaign, which followed the visit to Canada by Philippine leaders. Read more. On April 13, 2014, unknown gunmen attacked 16-year-old Topacio Reynoso Pacheco and her father, Alex Reynoso, killing Topacio and leaving Alex seriously injured. Both were active in their municipality of Mataquescuintla, standing up for land and the health of the planet in the fight against Tahoe Resources’ Escobal mine in neighboring San Rafael las Flores, Guatemala. 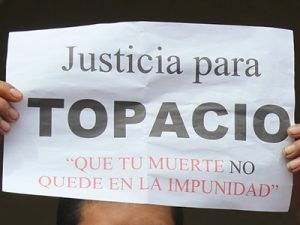 Three years later, little has been done to bring Topacio’s killers to justice. Take action now. 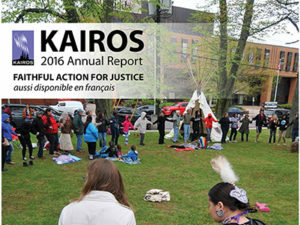 Download the 2016 annual report of KAIROS’ activities and financial performance. The KAIROS Blanket Exercise continues to make the news…. The next KAIROS Times will come out in September. We wish you and your family a wonderful summer! 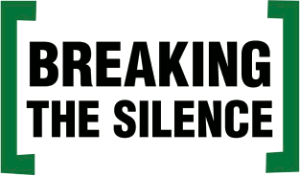 Breaking the Silence is a voluntary network of people in the Maritimes who began organizing in 1988 to support the efforts of Guatemalans struggling for political, social, and economic justice. The network is committed to supporting structural transformation in both Guatemala and Canada. Inspired by Guatemalans working for peace with justice, Breaking the Silence works with partner organizations to create relationships and projects based on solidarity, friendship, and human rights advocacy. 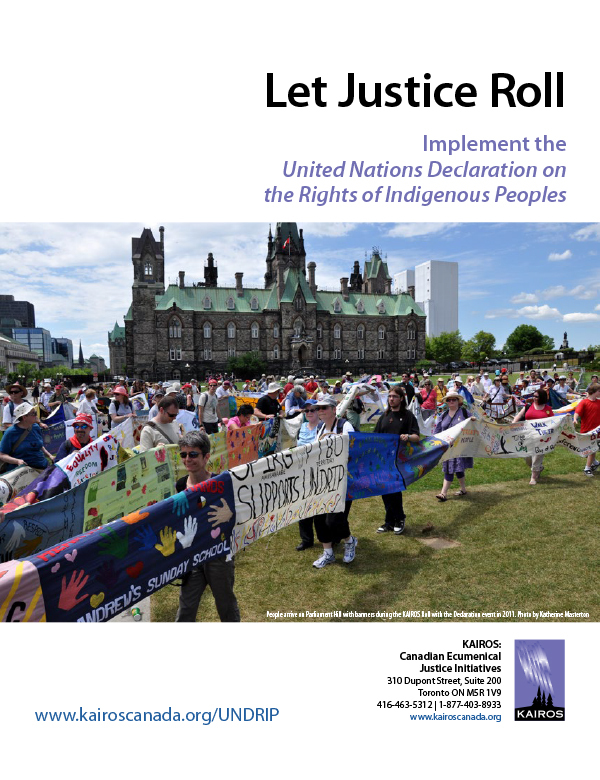 This resource provides a guide for taking action to ensure that the Government of Canada takes the necessary steps to revise federal legislation so that all relevant legislation is consistent with the UN Declaration. Download resource. We sat around the glowing rocks. The rattle, glowing above the rocks, kept rhythm, while the drums played and William sang. Dave, a United Church Pastor, and I sat next to each other, surrounded by the heat and darkness of the sweat lodge. We had been invited, to ground the reconciliation work we were a part of in ceremony. Read more. I came across the Blanket Exercise last spring when I was looking for ways to engage in Indigenous rights issues. 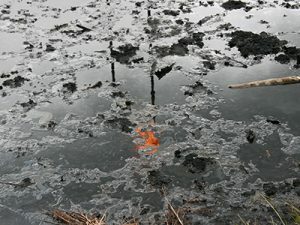 Why Indigenous rights issues? Because it seems to me that the relationship with Indigenous peoples is foundational for who we are in this place. If that relationship is not based on mutual respect and if it doesn’t provide positive outcomes for both groups, then all we have built here is like the proverbial house built on sand. Read more. Earlier this month, I joined a group walking from Kitchener-Waterloo to Ottawa, called the Pilgrimage for Indigenous Rights. Organized by Mennonite Church Canada and Christian Peacemaker Teams, the pilgrimage had two primary goals. Read more. Our lands/territories are sacred in the Gitxsan Nation like yours. When the Gitxsan entered into negotiations with the Federal Government and the Provincial Government in 1994, we presented the following tenets or precedents to both Governments and these still this hold to this day. Read more. I have always struggled with the traditional spiritual disciplines. 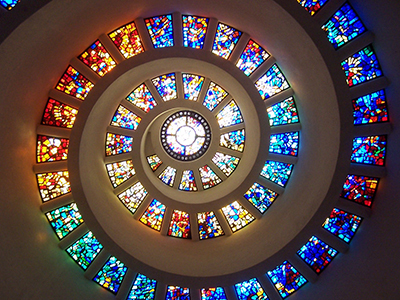 But I’ve come to realize that there are many more spiritual disciplines than those the church has typically held up. And for me, personally, what has become an important way of encountering the Spirit is through the very mundane act of riding the bus to work. Read more.